Look at what came in the mail for me this week! I have hearts for eyes. As far as I'm concerned, this series just keeps getting better. In this third installment, Princess Magnolia is on her way to have brunch with a friend when she gets word of a monster emergency. But when she arrives at the scene she doesn't see any danger, just a lot of cute bunnies! Oh man, this one made me laugh. 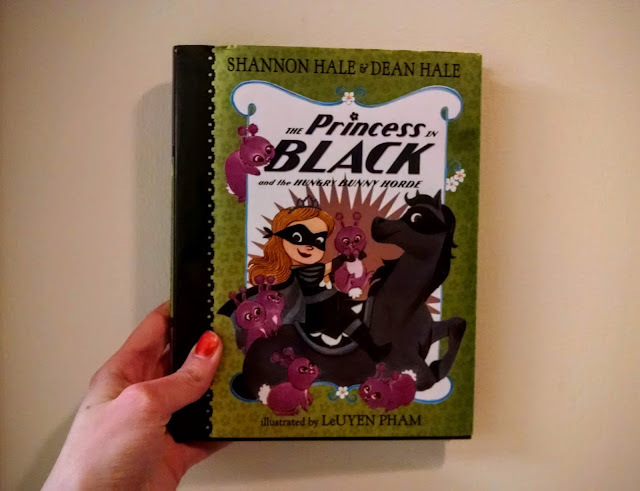 I love how the kids figured out that the bunnies were bad before The Princess in Black figured it out. Jacob said his favorite aspect was the unexpected hero (I won't spoil it for you!) and I have to agree. Benjamin said his favorite part was the very last paragraph. It incorporates some subtle humor, and it made him laugh. Levi said his favorite part was how it ended. Jubilee said her favorite part was "bunnies!" It came in the mail for me (courtesy of Candlewick Press), and we read together on the kitchen floor the moment the boys got home from school. Another fantastic addition to my current favorite early chapter book series. So speaking of chapter books, what age did you start chapter books with the kids? (I guess with multiple kids, the youngers earlier than the elder probably.) Also, do you already have a post about what chapter books you would start with? I feel like I'm ready to start something with Addison, but I'm not sure where to start since I'm so limited in my kidlit. "Harriet the Spy" was a favorite of mine in childhood, I remember, but is that still too old. Tips?